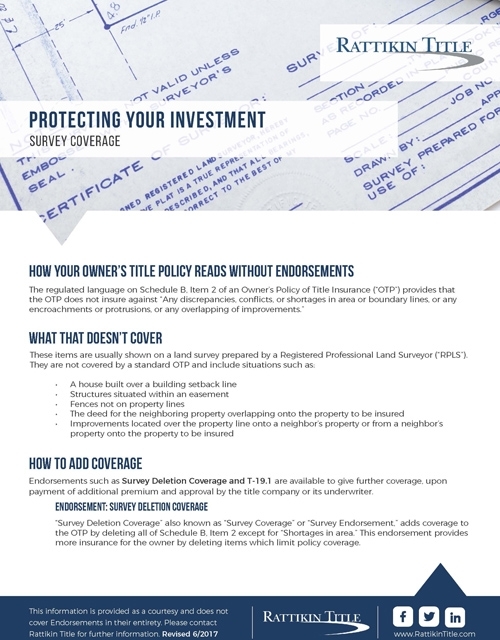 Endorsements such as Survey Deletion Coverage and T-19.1 are available to give further coverage, upon payment of additional premium and approval by the title company or its underwriter. “Survey Deletion Coverage” also known as “Survey Coverage” or “Survey Endorsement,” adds coverage to the OTP by deleting all of Schedule B, Item 2 except for “Shortages in area.” This endorsement provides more insurance for the owner by deleting items which limit policy coverage. Note: There may be survey exceptions which the title company deems too much risk. In these cases, the title company may choose to not provide coverage for that particular item. Although Schedule B, Item 2 will be revised to read “Shortages in area,” the title company may make specific exceptions to matters shown on the survey, such as buildings situated over a building setback line, improvements located in an easement, etc. These exceptions will be specific to both the property to be insured and the survey provided. An additional premium is required for issuance of either or both of these endorsements. NOTE: All coverages, endorsements and premiums are subject to change. Please discuss these and other endorsements available to you, and any applicable premium, with your Escrow Officer. Also refer to the Rattikin Title Premium Calculator on our website.